Yu-Gi-Oh! TCG Event Coverage » 2018 Central America WCQ and Dragon Duel WCQ Trophies! Home > 2018 Central America WCQ, Championships	> 2018 Central America WCQ and Dragon Duel WCQ Trophies! The 2018 Central America WCQ and Dragon Duel WCQ Prize Table has been set up, but all eyes are on only one prize. The trophies are beautiful. The photo above doesn’t really do them justice. The Top 4 Duelists in the Central America Dragon Duel WCQ and Top 8 Duelists in the Central America WCQ each receive a trophy. 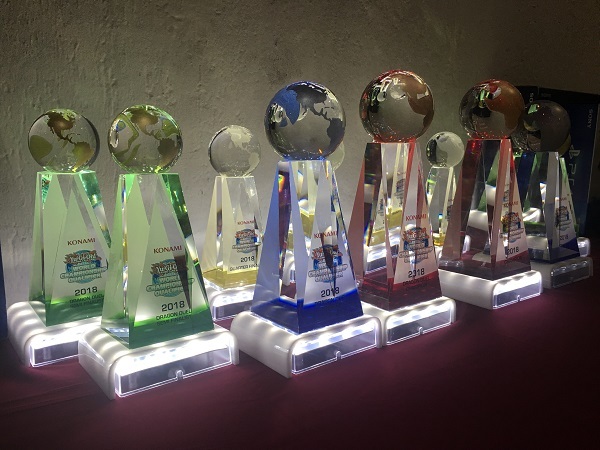 Duelists have their eyes on the largest trophy in particular – awarded only to the first place Duelist in the Central America WCQ and first place Dragon Duelist in the Central America Dragon Duel WCQ. Duelists receiving that trophy will also be given an invitation to compete in the World Championship in Tokyo, Japan later this year. That’s not something that fits on a table, but it’s easily the most sought after prize. Duelists who make the Top Cut but don’t take first place will be awarded complete booster sets, electronics, booster packs, game mats, and a variety of other prizes on the prize table.